Once the NSU3D suite is obtained and built (see Getting Started), download the tutorial files here. If your system tar command does not support inline gzip compression, then you will need to run gzip -d on each archive and then use tar xvf to unpack it. Check consistency of bcs and comp files by running tecform as given in the RUN.tecform1 directory. f6wbnc.bcs: Boundary condition file; associates a bctype with each patch in the mesh geometry. 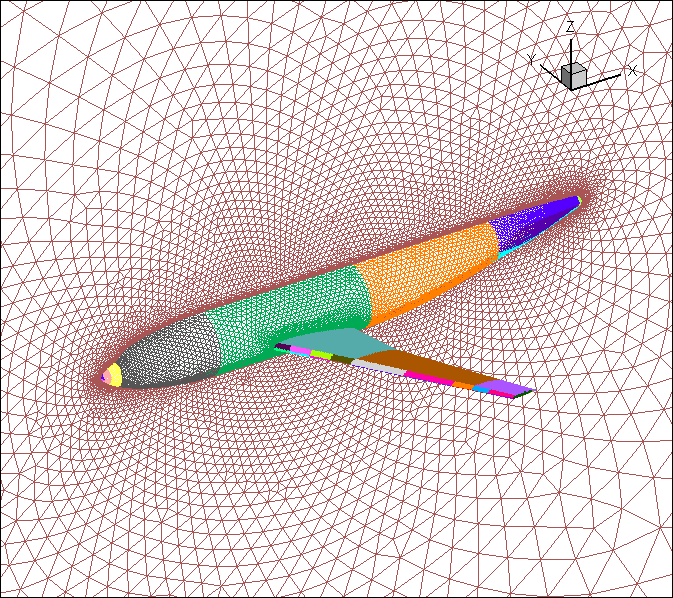 f6wbnc.comp: Component file; defines components based on patches in the mesh geometry. Integrated force coefficients are output based on components as well as bctypes. f6wbnc.mcell: Initial (unprocessed) grid file in mixed element format (see mcell file definition in documentation). This is an unformatted fortran file in real*8 precision. The mcell file is the product of a grid generation procedure and is output by the grid generation software. Various grid generation codes support the mcell format (ICEM and Pointwise NSU3D formats). Converters are provided to convert other grid generation formats to mcell format. pre_nsu3d also supports other file formats (vgrid and b8.ugrid: see Compatible Model Grids for more information). The bcs and comp files may or may not be output by the grid generation software. In general, the bcs files output by ICEM and Pointwise work, but may have bugs or may be formatted in an non optimal way. Thus it is often useful to construct these by hand. 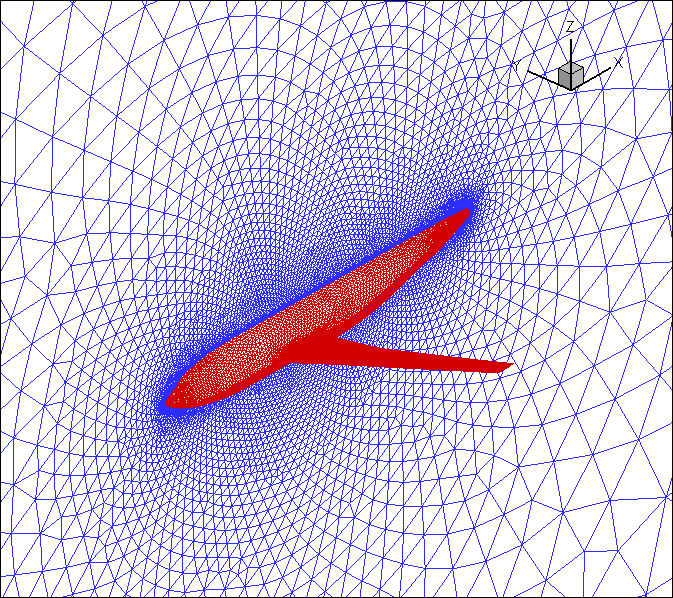 produces a tecplot file which can then be viewed in tecplot where each surface patch is identified as an individual zone in tecplot. 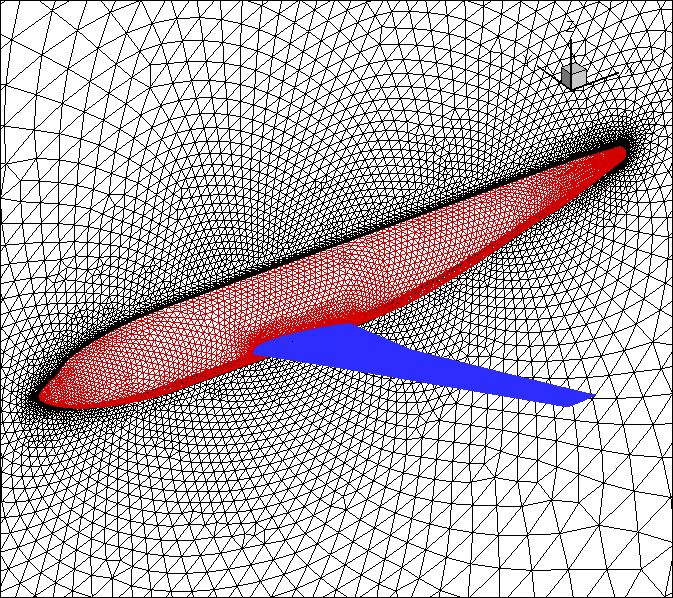 produces a tecplot file where each boundary condition or each component is identified as an individual zone in tecplot. 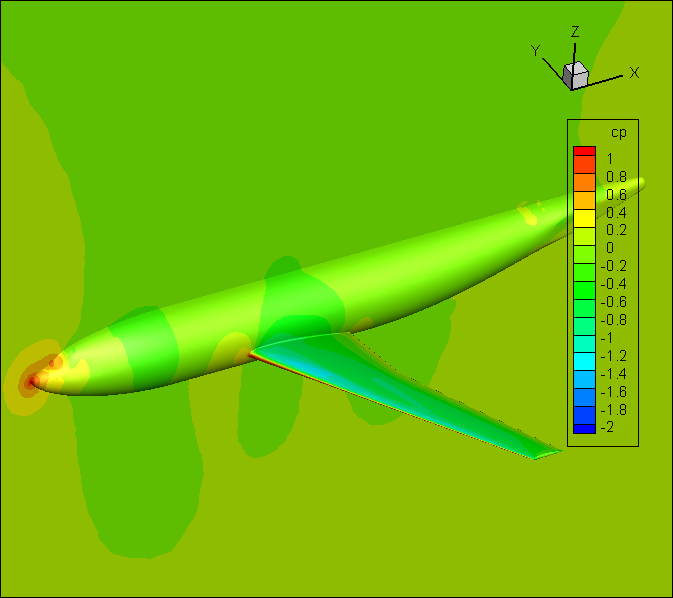 The results produced by these 3 runs are given in the subdirectory RESULTS, including the resulting tecplot file, and a png figure (shown above) produced using the accompanying tecplot layout file. It is strongly recommended to run these visual checks on the bcs and comp files prior to preprocessing the mesh and running the flow solver. For simplicity this example uses option 1, which also provides the user with a better understanding of how the software works (compared to using the scripts). In order to preprocess the f6wbnc.mcell mesh, the pre_nsu3d code is invoked using the supplied input file: input.pre_nsu3d This input file lists the mesh file (f6wbnc.mcell) and corresponding bcs and comp files. The preprocessing partitions the mesh but also constructs the line data-structures and coarse multigrid levels for the NSU3D solver and outputs all required information in a directory with individual partition files called f6wbnc.part.n where n is the specified number of partitions (128 in this example) For multigrid runs, the preprocessor must be run twice when the mesh is partitioned for the first time. This creates the directory with all part files called casename.part.1 This can be useful for debugging or comparing parallel cases with sequential runs. Note there are 2 scripts that can run pre_nsu3d and amg3d with a single command. However, these use a particular command for mpirun which may differ on different computer architectures. In order to work on your specific architecture, the command may need to be edited (in the .sh script) or set by an ENV variable in the python script, see running pre_nsu3d for more information. Note the file input.post_nsu3d is created by NSU3D in the resulting ./WRK directory. In the directory /F6.STEADY.regtest/RUN.tecform1 there are some example tecplot input files. In the subdirectory "RESULTS", the resulting tecplot files and produced png figures (shown below) using the corresponding tecplot layout files are provided for comparison. A regression test is provided to verify that the users given architecture and compiled code gives the correct solution. This regression test uses the results of the above F6wbnc Steady tutorial test case and requires the user to follow the instructions exactly, specifically with naming output files and folder locations. In the RUN.regression_test folder is a script to run tests on nsu3d: pre-processor, flow solver, post-processor. The tests compare output file statistics, grid header files, solution surface forces, and tecform ascii files. The pre-processor regression test uses parmetis-4.0.3 for the partitioner. 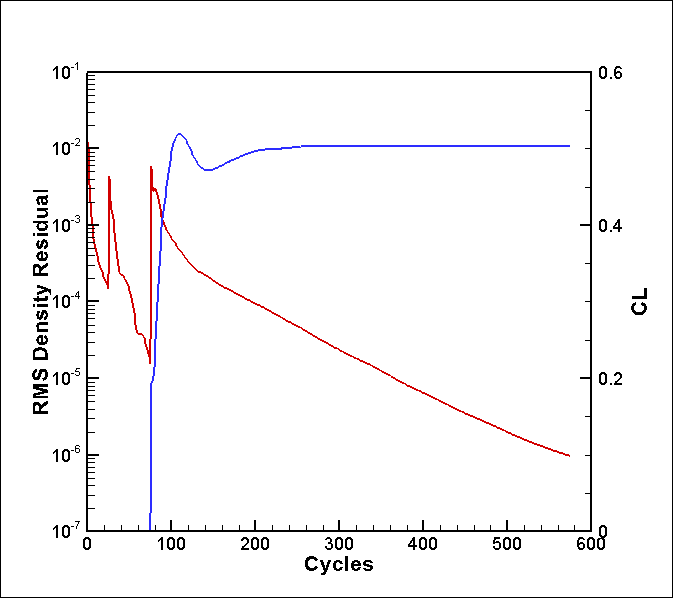 Note: it is possible to get different pre-processing results that will still produce the correct flow solver solution. If you would like to test the pre-processor that is independent of the parallel partioner used simply run the regression test with option to test on 1 processor.